Gorkha Janmukti Morcha chief Bimal Gurung today left for Delhi, along with party general secretary Roshan Giri, catching even his own cadres by surprise. Gurung did not tell reporters the purpose of his visit. But when asked if the visit was personal, he said "yes". Morcha sources said even Giri did not know that he had to leave for Delhi today. "Roshan was asked to accompany him (Gurung) to Delhi only this morning. In fact, Giri had to scurry for the airport. By the time Giri left for the airport, Gurung was already half way through his journey to Bagdogra," said a source. He added that two other senior Morcha leaders were also asked to accompany Gurung at the last moment. "They, however, could not make it because the decision was taken at the last moment," he said. 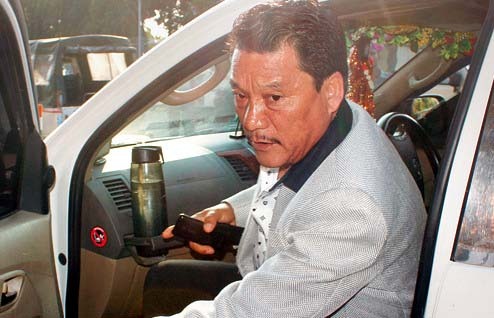 According to Morcha sources, for two-three days, there was a "buzz" in the party circle that Gurung might leave for Delhi on Friday. "But the purpose of visit and the agenda have not been made known." When Giri was contacted by The Telegraph this afternoon, he said: "Yes, daju (Gurung) is leaving for Delhi. I am also scurrying to the airport. I do not know much." At Bagdogra airport, Gurung did not divulge much. He said he would not speak to the media but when reporters asked him if the visit was personal, he said "yes". Asked how long he would stay in the capital and whether he had plans to meet any central minister, Gurung said: "Probably for a few days. There are no plans." Gurung's decision to leave for Delhi came on a day bail petitions of Morcha leaders, including Gurung, in relation to the Madan Tamang murder case were scheduled for a hearing at Calcutta High Court. The case, however, did not come up for hearing today. Last year, 23 people, including senior Morcha leaders like Gurung and Giri were named in the chargesheet in the case related to the murder of ABGL leader Madan Tamang. He was killed in Darjeeling on May 21, 2010. <>Leaders like Harka Bahadur Chhetri, who is now the president of Jana Andolan Party, and Bhupendra Pradhan, the chairman of GTA Sabha who is now with the Trinamul Congress, have also been named in the chargesheet. Chhetri and Pradhan were with the Morcha in 2010. at the time the murder took place. Sources said that the bail application did not come up for hearing at the Calcutta High Court. Gorkha Janmukti Morcha chief Bimal Gurung today left for Delhi, along with party general secretary Roshan Giri, catching even his own cadres by surprise. Gurung did not tell reporters the purpose of his visit.